Capital of eastern Rumelia, or southern Bulgaria. Historical data of the early years of its Jewish community are very meager. The anonymous author of an appendix to the Judæo-Spanish "Yosippon" (Constantinople, 1743; see Zedner, "Cat. Hebr. Books Brit. Mus." p. 345) states that Jews were to be found in Philippopolis in 1360, the date at which the city was conquered by the Turks (761 A.H.). The reigning queen at that time, Theodora, was a Jewess of Tirnova, who had married the Bulgarian czar Ivan Alexander. Certain Jews who emigrated from Aragon in 1492 settled in Philippopolis and built a synagogue called "K. K. Aragon," which was standing in 1540, but is no longer in existence (see R. Samuel di Medina, Responsa Ḥoshen Mishpaṭ, No. 216). On two separate occasions two Jews were murdered in the environs of Philippopolis, reference to the crimes being found respectively in a legal question submitted to the above-mentioned Samuel di Medina and dated 1571 (5331), and in a similar question submitted to the chief rabbi of Constantinople, Joseph ben Moses di Trani, and dated 1640. In both instances the murders were committed by Turkish spahis. In the local cemetery are the tombstones of Israel Aobi (d. 1690), a learned chief rabbi of the community, and of Rabbi Solomon Safir (d. 1716). About the year 1779 the Jewish community of Philippopolis consisted of about 150 families (see "Anuar Penetru Israeliti," 1888, xi.). During the last days of Turkish rule in Philippopolis Hadji Moshon (Moses) Garté was "millet-bashi" (official representative of the community in temporal matters before the magistracy) and member of the criminal court, Samuel Annabi was a member of the court of appeal, and Isaac Caleb was municipal councilor. The Jewish population at that time comprised 250 families. At the approach of the Russians in 1876 most of the Jews fled to Adrianople and Constantinople. Those who remained sent a delegation to the conqueror, General Skobeleff, who promised and granted protection to them. They willingly gave shelter to the Russian soldiers. The Jews did not take part in the overthrowing of the Turkish government by Prince Alexander (Sept. 13, 1885), because it occurred on the Day of Atonement. 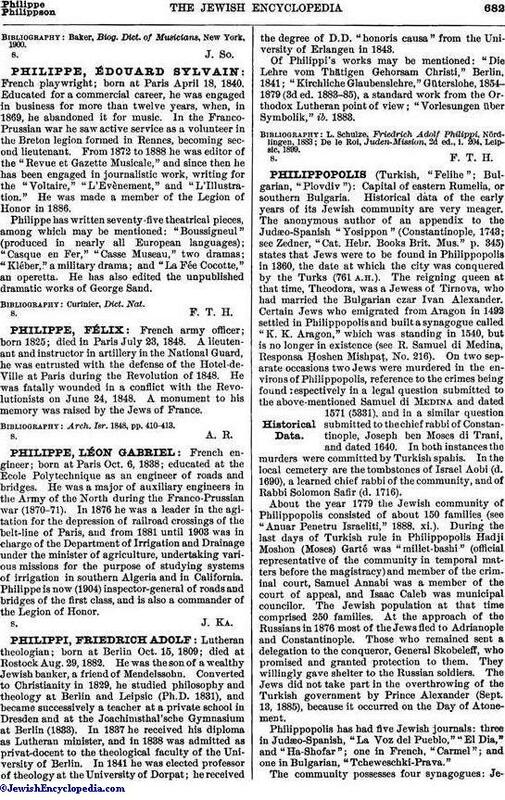 Philippopolis has had five Jewish journals: three in Judæo-Spanish, "La Voz del Pueblo," "El Dia," and "Ha-Shofar"; one in French, "Carmel"; and one in Bulgarian, "Tcheweschki-Prava." The community possesses four synagogues: Jeshurun,built in 1710 according to the inscription on a marble slab in the synagogue; Ahabat-Shalom, built in 1880; Shebeṭ Aḥim or Mafṭirim, founded in 1882 by emigrants from Karlovo, whence the Jews fled during the Turko-Russian war (1877-1878); and Zion, built in 1892 on the site of a former synagogue. It has also two schools, controlled by the Alliance Israélite Universelle, the Anglo-Jewish Association and the communal council aiding in their support. The pupils comprise 473 boys and 475 girls. There are several charitable and educational associations besides a Zionist society, a lodge of the B'nai B'rith, and several women's clubs. Three Philippopolis Jews are serving in the Bulgarian army, namely, Moschonoff Garté, who is an officer, and Drs. Alcalai and Tcherner, who are attached to the garrison. 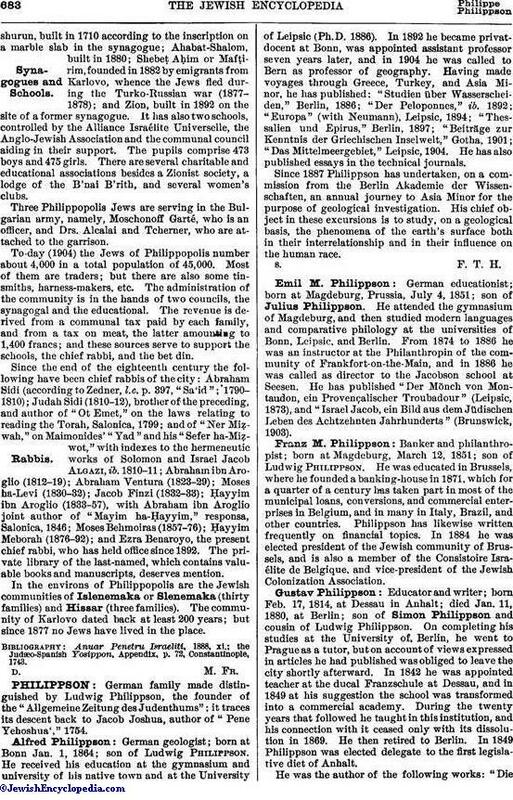 To-day (1904) the Jews of Philippopolis number about 4,000 in a total population of 45,000. Most of them are traders; but there are also some tin-smiths, harness-makers, etc. The administration of the community is in the hands of two councils, the synagogal and the educational. The revenue is derived from a communal tax paid by each family, and from a tax on meat, the latter amounting to 1,400 francs; and these sources serve to support the schools, the chief rabbi, and the bet din. Since the end of the eighteenth century the following have been chief rabbis of the city: Abraham Sidi (according to Zedner, l.c. p. 397, "Sa'id"; 1790-1810); Judah Sidi (1810-12), brother of the preceding, and author of "Ot Emet," on the laws relating to reading the Torah, Salonica, 1799; and of "Ner Miẓwah," on Maimonides' "Yad" and his "Sefer ha-Miẓwot," with indexes to the hermeneutic works of Solomon and Israel Jacob Algazi, ib. 1810-11; Abraham ibn Aroglio (1812-19); Abraham Ventura (1823-29); Moses ha-Levi (1830-32); Jacob Finzi (1832-33); Ḥayyim ibn Aroglio (1833-57), with Abraham ibn Aroglio joint author of "Mayim ha-Ḥayyim," responsa, Salonica, 1846; Moses Behmoiras (1857-76); Ḥayyim Meborah (1876-92); and Ezra Benaroyo, the present chief rabbi, who has held office since 1892. The private library of the last-named, which contains valuable books and manuscripts, deserves mention. In the environs of Philippopolis are the Jewish communities of Islenemaka or Slenemaka (thirty families) and Hissar (three families). The community of Karlovo dated back at least 200 years; but since 1877 no Jews have lived in the place. the Judæo-Spanish Yosippon, Appendix, p. 72, Constantinople, 1743.